UK feminine hygiene brand Bodyform has responded to Facebook criticism with a scathing video ridiculing the male perpetrator’s naivety. Rather than ignore the tongue-in-cheek complaint or attempt to disarm it with a diplomatic reply, the brand created a video reply from a fictional CEO in which it confesses to lying about periods being happy occasions, a depiction typically used in its advertising. 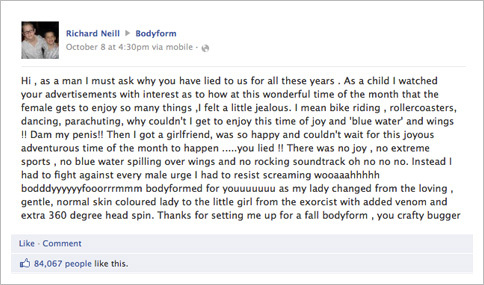 Last week, Richard Neill took exception with Bodyform’s advertising posting a rant on the company’s Facebook wall calling the brand out for false advertising and saying his girlfriend becomes “the little girl from the exorcist with added venom and extra 360 degree head spin” when having a period. She goes on to explain the reasons they adopt an upbeat ad strategy, commenting that it’s better than showing “the blood coursing from our uteri like a crimson landslide”. The bold move is a departure from the meek responses that have characterised responses to Facebook criticism on brand pages to date, and in doing so amassed as much positive support from Facebook users as the post it was responding to.